A humanitarian aid convoy has entered the besieged town of Madaya in southern Syria, where people are said to be dying of starvation. Locals say rebels are charging them $250 for a kilogram of rice, an RT crew on the spot says. The UN confirms the convoy’s presence in the city. Lorries are carrying basic food items as well as water, baby food, blankets, medicines and surgical supplies. "Two trucks carrying food and two others full of blankets entered Madaya at 5:00 pm [15:00 GMT]," an official from the Syrian Arab Red Crescent also told AFP. Simultaneously, first aid convoys arrived in the villages of Foah and Kefraya besieged by rebels in the northern Syrian province of Idlib, the BBC reports. Several convoys consisting of 60 lorries operated by the UN, the International Committee of the Red Cross, the Syrian Red Crescent and the World Food Program left for Madaya, Foah and Kefraya on Monday morning. Earlier, the UN said it had received credible reports of people dying of starvation in these settlements. Humanitarian aid on 39 trucks is expected in Madaya, RT’s Murad Gazdiev said, reporting from the area. The humanitarian aid comes thanks to an agreement between the warring sides in the areas where thousands of people are under siege. Media coverage is low, and there are no Western journalists there, according to Gazdiev. However, since the start of January, social media and MSM have been flooded with reports, saying many have died of starvation in the besieged town of Madaya, and that government forces loyal to President Assad are to blame. Various media outlets, including the Telegraph, the Independent, BBC, CNN and Fox news said Syrians were eating domestic animals, and had been left without any help. 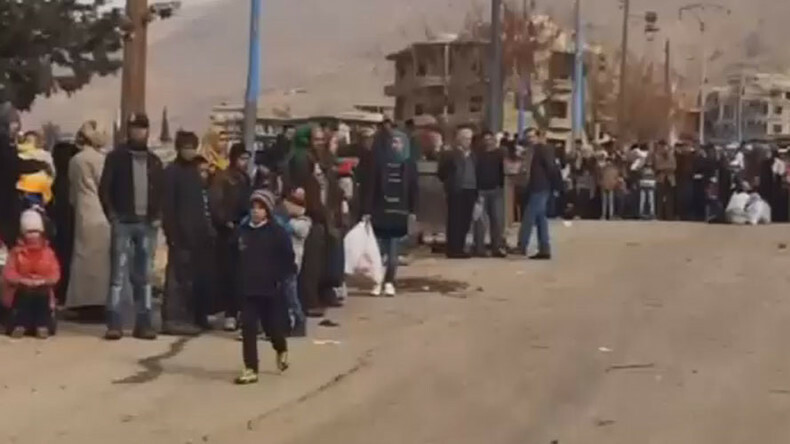 Some media didn’t bother to re-check the authenticity of images allegedly showing dying Madaya residents. No one has as yet been able to confirm that the images are actually authentic. RT decided to investigate the photos. One haunting image posted on Arab-speaking social media shows a starving man supposedly lying somewhere in the streets of Madaya, a town with a population of about 9,000 people. "The victims of starvation caused by Bashar Assad, Hezbollah and Iranian militias on Madaya and Al-Zabadani,” says the caption under the image. However, the story behind the starving man turned out to be fabricated. In fact, he starved to death in the city of Ghouta a year ago, according to the Syrian American Medical Society. The picture was taken on January 13, 2015. “Mohammad Yoususf An-Najjar, disabled, from Damascus died on 13 January due to extreme cold and lack of food during the government forces’ siege of Eastern Ghouta,” the Syrian network of human rights said. An image of a Syrian girl that appeared in Arab media prompted global condemnation of Assad’s policies. It was claimed she had turned into a lifeless shadow of herself due to extreme starvation. However, the girl appears to be safe and sound in Jordan. According to MBC TV, this picture was taken in the streets of Amman, the Jordanian capital, in January 2014. An image published by the Telegraph and Aljazeera shows a starving boy, who they said was in Madaya. However, it turned out that a YouTube video featured the Syrian boy in May 2015, before the crisis in the town started. Another horrendous picture of a starving man in Madaya has turned out to be a drug addict (or refugee, according to other sources) taken in Europe in 2009. His eyes were even Photoshopped to hide the fact they are blue. The image originally appeared on Al Jazeera. It was subsequently deleted, but not before it had been retweeted many times. The Red Cross said they can’t confirm the authenticity of the images.